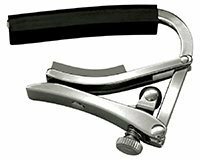 Capos are small devices which are used on stringed musical instruments. When placed on the strings or on a particular fret of the instrument, the playable length of the strings is shortened and so the pitch of the instrument is heightened. This easy heightening of the pitch of the instrument allows the player to play a musical piece in a different key while still using the same fingerings they would use normally. The following is a chart of 11 of the best capos available on the market today. Keep reading for a short review on all 11. 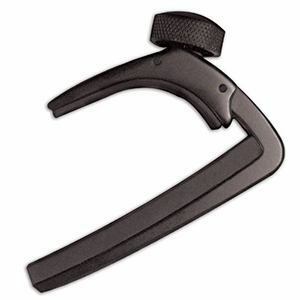 The following are reviews of eleven of the best capos available on the market today. The Shubb GC-30 Deluxe is a capo made exclusively for acoustic guitars. It is constructed from strong stainless steel which is resistant to scratches and uses a roller action which prevents wear. 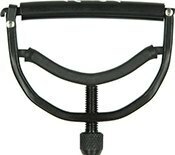 Shubb capos are known for their ability to press the strings down just as your fingertips do and so do not create tuning problems. This capo is made from zinc alloy and has a faux rosewood finish on the exterior. The look is a nice alternative to the black or chrome finishes of typical capos. It especially looks nice on an acoustic guitar. The underlying metal gives the capo the strength needed to perform as expected. This capo comes with a couple of real rosewood picks as a bonus. 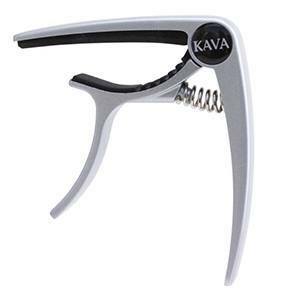 By comparison, this capo is a little less expensive than most of the capos in list. To give your acoustic a cool look, consider this offering from TimbreGear. 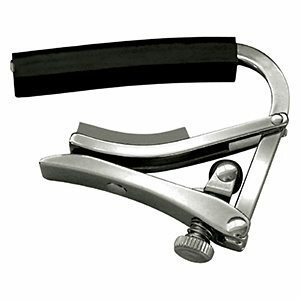 This chrome capo works well with acoustic and electric guitars as well as with banjos, mandolins and ukuleles. The underlying zinc alloy provides strength for the capo. Silicone pads protect your instrument while performing their task. The manufacturer offers a lifetime warranty that provides for full replacement should you encounter a problem. 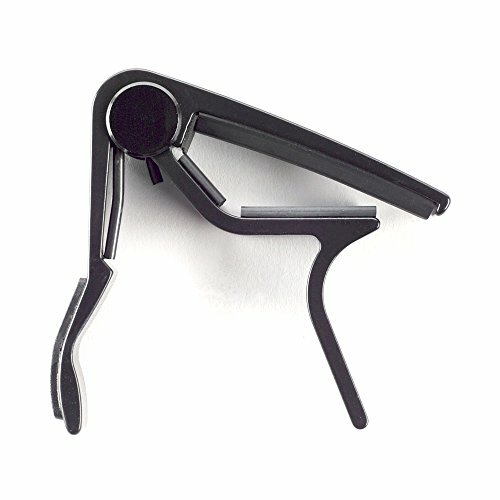 If you want the most versatile strong capo in the world, this one just might be it! Crafted for just about any instrument with a string and a neck, the Nordic Essentials can be used for electric and acoustic guitars with six or 12 strings, four-string basses, ukuleles, banjos, and mandolins. The package we highly recommend comes with two capos and two carrying pouches, along with a lifetime warranty. Available in several different color sets: green and blue, red and gold, pink and purple and silver and black (shown). 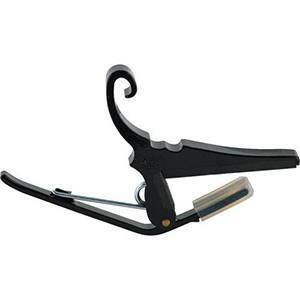 The Jim Dunlop 83CB Acoustic Trigger Capo fits most acoustic and electric guitars. It is very strong as it is made from aircraft quality aluminium. Jim Dunlop produces professional quality capos which are available at an affordable price and the 83CB is no exception. 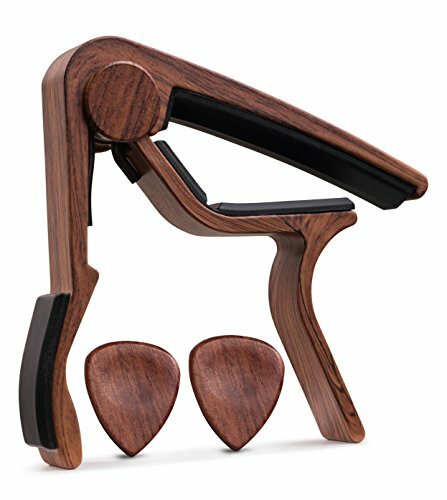 Available in 5 finishes, the 83CB’s ergonomic design and padded handle makes this capo a delight in comfort to use. 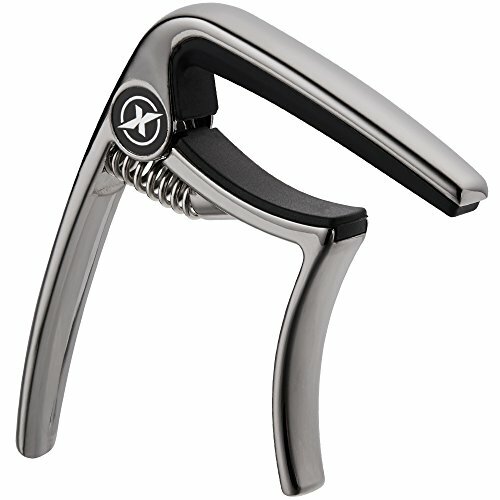 The Kyser® Quick-Change™ 6-String Capo is an affordable capo of professional quality. It fits any fret position and is available in a vast array of colours and patterns including black, gold, silver, blue, camouflage, pink, red, white and even the US flag. 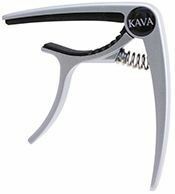 The Kyser® Quick-Change™ system allows this capo to be changed quickly with one hand without the need to loosen, readjust or tighten the capo before performing. Another high-end option comes the folks at Kava Audio. In terms of build quality, this is probably the best option on the whole list. It utilizes a strong and sturdy, yet quite light aluminum body, giving the item more strength and durability, as well as sexier looks. It's secure, durable, and reliable – an easy 10/10 from here! 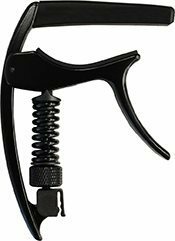 The Planet Waves NS capo is designed especially for use on acoustic and electric guitars which are built with radiused fretboards. This capo can easily be used with just one hand. Ultra-light aircraft grade aluminium makes this capo super strong and likely to last a lifetime. It can be used on 6 or 12 string guitars. 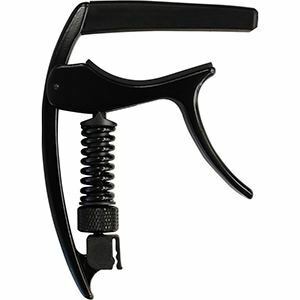 The Planet Waves NS capo is also available in a classical guitar version. 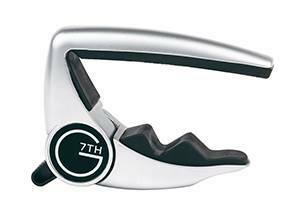 With it’s patented clutch system the G7th Performance Capo allows the pitch of the instrument to be adjusted without the need to retune. The capo features a lever which is easily operated with one hand, making this capo efficient and easy to use. It is moulded from solid zinc-alloy and comes with a lifetime warranty. Super precise and super strong, this Planet Waves puppy features micrometer tension adjustment that secures an absolute buzz-free performance that's always in tune regardless of which fret you're strumming. If you're obsessed with 100-percent accurate tuning and tonal accuracy, this is the one you've been yearning for. The item is very easy to use and features an aircraft grade aluminum construction. It even has an integrated pick holder to make your playing even more convenient. Killer stuff! Featuring a slightly different design and a very strong grip, the Pa﻿i﻿ge PGE is a type of capo that just won't let go. The device is locked in behind the nut and is actually fairly easy to move around, although it usually can't be done with just one hand. 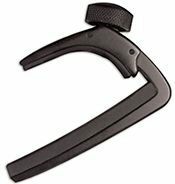 What makes the capo stand out is the mentioned firm grip; this puppy locks in in the best possible manner, producing zero fret buzz and no muted strings.